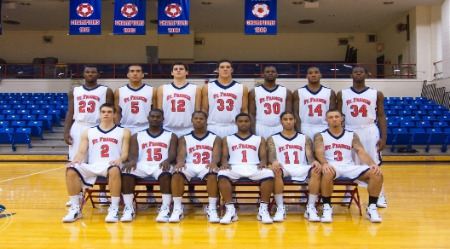 The St. Francis College Men’s basketball team has a new attitude after a 15-15 finish in 2010 that kept them out of the postseason. A half-hour after the Men’s Basketball practice ends, senior swingman Stefan Perunicic is still on the court, working on his mid-range jump shot, embracing every swish and critiquing every missed shot. The Brooklyn-native Braica brings a young squad on the court this season, with only three seniors on the roster. He does have a good amount of experience. Along with Perunicic, senior Dre Calloway and sophomore Matt Milk both started at least 16 games for the Terriers last season. The team also brings back Akeem Johnson, who averaged 8.9 points per game despite being used mostly as a bench player. The 6-foot-6 Johnson also spent the off-season improving his jump shot and bulking up. Johnson reportedly added 15-pounds of muscle during the offseason. The Terriers will also see a tougher schedule this season, including an early road test against St. John’s, who were voted just short of a spot in the pre-season Top 25 Coach’s Poll. Along with St. John’s, St. Francis will face Hofstra, who finished third in the CAA last season, and Seton Hall. Despite all of this, there is one game that Johnson has a more personal stake against. Johnson said: “We owe LIU a rematch at Madison Square Garden this year so that should be a game to look out for.” Last year, the Terriers lost back-to-back games to LIU-Brooklyn, the second of which ended with a buzzer-beater field goal by LIU. The Terriers will have their home opener on Dec. 19 when they face the University of Albany at the Pope Physical Education Center at 7 p.m.